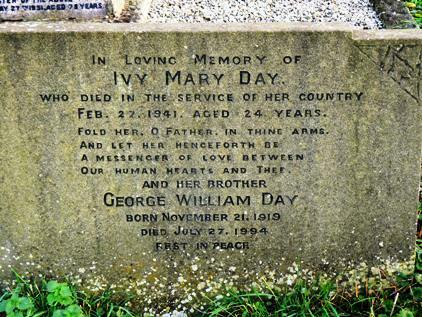 The name of Ivy Mary Day appears on the Tytherington Church War Memorial. She is the only woman and civilian whose name appears on the memorial. She worked at Parnall in Yate, a company which produced parts for bomber aircraft during World War 2. She was one of 52 workers who died on the 27th February 1941 when a single German Luftwaffe aircraft bombed the factory from a height of just 30 metres. As well as the deaths 153 workers sustained injuries, many of these had returned to the damaged buildings in an attempt to collect files, at which point bombs on long delay fuses exploded. 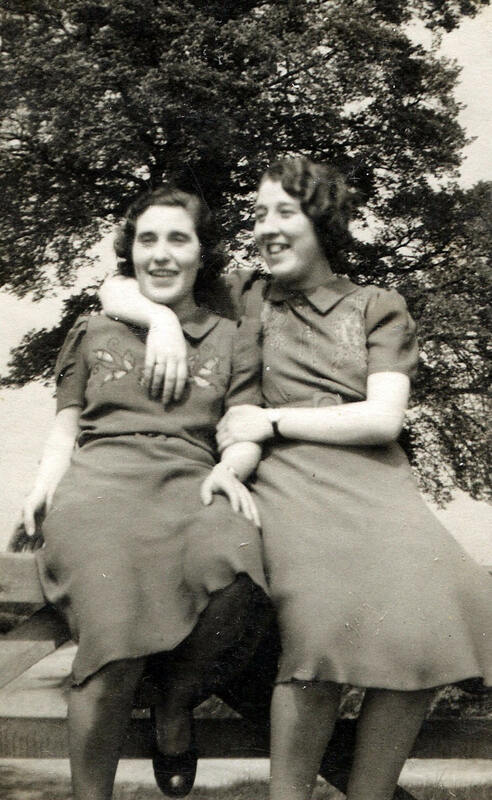 "My parents were licensees of the Railway Hotel in Yate during the War and of course they were very busy because Parnalls had two lunch hours, one for the aircraft factory workers and one for the administrative workers. Parnalls had a canteen run by a gentleman who had been a catering officer for P and O cruise lines. Even so, there was only 45 minutes for the workers lunch break, so the hotel bar became very busy and there was also a market every week. We had just closed, it must have been about 2 o'clock. The siren went off and immediately, before it had stopped, the bombs were dropping. It was a single aircraft. Some bombs dropped on the factory, but some dropped on a gunnery school which probably tested the gun turrets, a number of them were killed during the air-raid. In that first raid a number of factory workers were killed. The German aircraft came in so low that you could see the pilot, a large part of the factory was very badly damaged so they evacuated some departments and then scattered them where they could. The cider factory at Melksham was a dispersal point, one in the Keynsham area, Bath, Wickwar and also in Bristol. Coaches would pick the workers up every evening from Yate and take them to the different premises for the nightshifts and also dayshifts. Parts of the factory were still usable, the factory made gun turrets for bomber aircraft. On the next payday Parnalls set up a couple of tables in the car park and paid the wages from there. The second time Parnalls was bombed, it was again by a lone plane, but by this time most of the production was elsewhere. The plane only had to follow the railway line to find the factory, which lay alongside the line at Yate. There were women working on the Production line at Parnalls all through the war. Until the Second Front was opened there were always three or four long Red Cross carriages waiting in the siding at Yate until they were required. 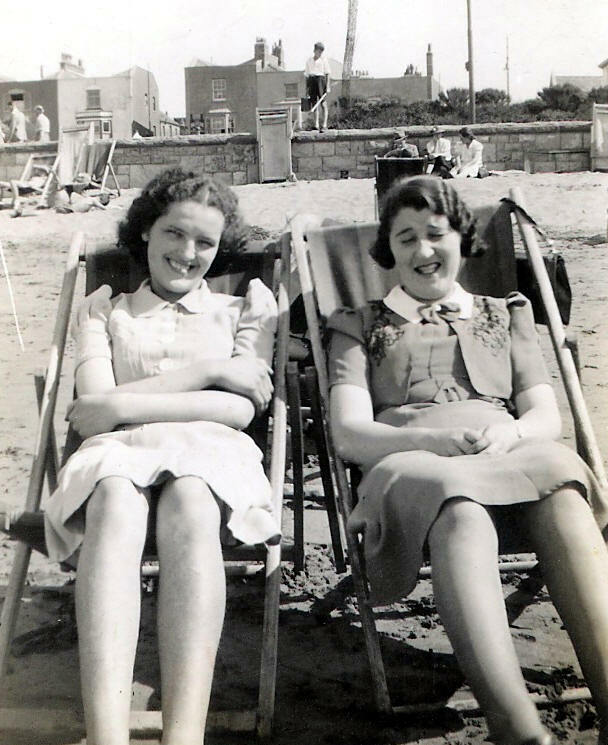 Yate also had an engineering factory called Newmans and they made shell casings there; and there were women working there too, although it was really far too heavy work for them". Roger Howell described how his father, living at Stidcott Farm, Tytherington heard the German plane on the day of the bombing and saw it flying low above the railway line through Tytherington heading towards Yate. Ivy Day is commemorated near St. Georges Chapel in Westminster Abbey on a list of 67,000 civilian casualties from the war. Ivy Mary Day was the daughter of Albert & Elizabeth Day of Stowell Hill, Tytherington. 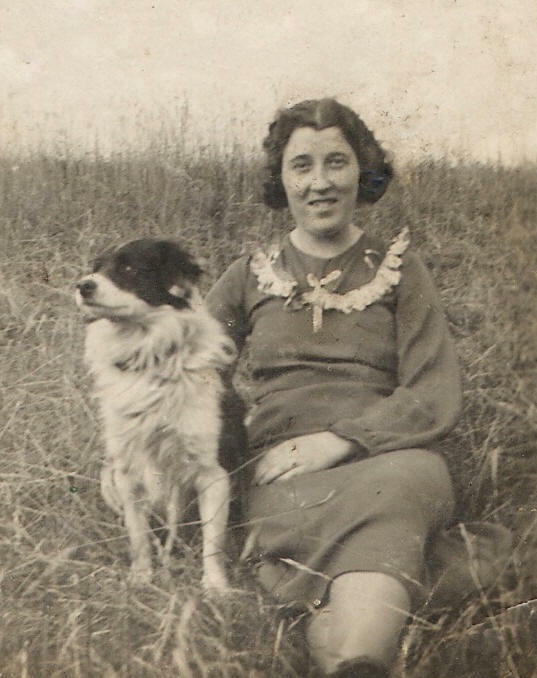 She was born on 27th July 1917 and attended the village school from 20th April 1925 until 24th July 1931, leaving aged 14. Ivy Day's headstone in Sodbury Cemetary, Glos..
Ivy Day with family dog Bonzo. Ivy Day (R) with sister Agnes.